Just a brief word today, to direct you to my guest post for Claire, at Promenade Plantings. Apple sauce is something that brings back memories of childhood… finishing the sauce after a roast pork dinner was always my “responsibility”! I haven’t eaten meat or fish for many years now, and certainly do not miss it, but I do sorely miss the sauces that traditionally accompany it. Therefore I embrace any possibility to integrate them into a vegetarian diet. Pasta, peas and parsley sauce is one example. Potato cakes with apple sauce is another. Please click and take a look at Promenade Plantings for my recipe for Reiberdatschi with Apple Sauce. And while you’re there, have a look at some of Claire’s wonderful posts such as this one on Social Gardening… excellent stuff! This entry was posted in Food, Random Thoughts, Recipes, Vegetarianism and tagged Autumn, Food, Germany, Recipes, Traditions, Vegetarian. Bookmark the permalink. ← Time for Pumpkin Cake! Mine loves it in a cheese sandwich! LOL! You should try this as you have all the ingredients locally! Start a new tradition in your county! LOL! 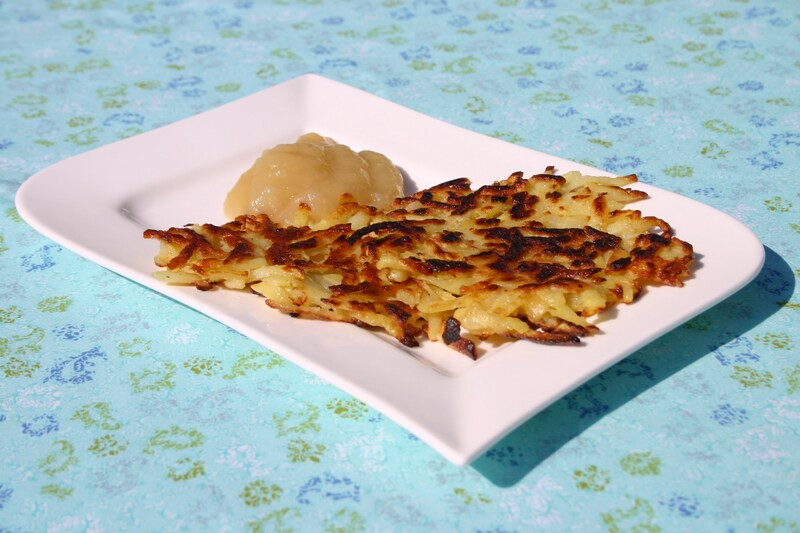 Haven’t had apple sauce with potato cakes, but will be trying that now. We use Dijon mustard when we make vegetarian sausages – maybe this doens’t really count as having mustard with the sausages, but it’s great for adding flavour to the mix! I might suggest this one to the Mrs! Ooooh, hot Amaretto and cream…. haven’t had that for a while! They call it “heiße Liebe” here. Perfect for a cold evening! Thanks for your comment Robin! Yum! This looks wonderful, Cathy. I love the combination of apple and potato flavors. Yes, they do go surprisingly well together. Thanks for your comment Gwynnem! Potatoe pancakes remind me of chilhood as I am german decent…we had the apple sause with cinnamon candies pink! use the mint sause on peas…. Hi Sharon – I agree that mint and peas go well together. I only started making the potato “datschi” recently, and love them! We just had “Kartoffel-puffer mit Apfelmus” – often in the apple-season. Hi Cathy, thanks for the wonderful post and the shout out, I’m really looking forward to trying this wonderful recipe out. Hope you have a super week !! Cathy, you’ve done it again. Everything you cook looks delicious! I do love potatoes prepared this way and I can imagine the applesauce would be great with them. My grandmother used to fry apples in butter until they started falling apart–always a treat for us when we visited in the fall. I haven´t had Reiberdatschi with apple sauce in a long time. After reading your post I realized how much I missed it! Must go out and buy potatoes…:-) By the way they said yesterday on the radio that it was “World Porridge Day”. Oh, I forgot… How about a salad dressing out of yoghurt and mustard?